How you ever tried doing a skill mashup? You make a list of all your skills, both professional and personal, and then pair them up in different ways to align them with different opportunities you might not have considered before. As Swatee Surve shares her story, she’ll illustrate what a skill mashup is all about! 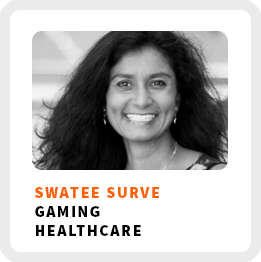 She’s the of founder of Litesprite, a firm that combines games, machine learning, and big data to improve health outcomes for a variety of chronic health conditions, which also happen to be a mashup of Swatee’s skills! Even while working for mega brands like Kodak, Nike, Microsoft and TMobile, she has always positioned herself at the forefront of innovative opportunities. How her natural attraction to innovation open up opportunities for her she couldn’t have imagined. How to know when to turn one of your ideas into a business. And if you are an experienced professional who thinks your time has passed to launch a startup, Swatee has some good news for you! Align your skills with your goals. Wake up time: Anywhere from 6:00 – 7:30am. Core work activities + habits: 1) Sales from origination to getting contracts closed. 2) Developing the product through research and finding results. 3) Deploying the product to the customers. Ideal work environment: Informal, comfortable work settings. Places with a buzz that foster collaboration, but not too loud. 90-day goal: Secure, formalize, and close some conversations to convert into customers; complete some key product improvements and features. Don’t have an idea for a business? Swatee suggests being patient and reflecting on whether you may have some internal blocks preventing you from pursuing certain thoughts and ideas. 1) Look for common themes in your ideas to see if there are roots to pursue. 2) Examine where you can drive unique value as the founder since you will be the focal point of your business in its early development.